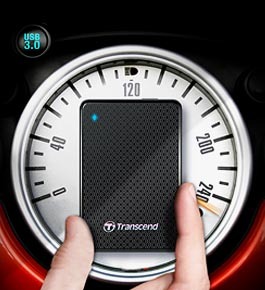 Featuring a next-generation SuperSpeed USB 3.0 connection interface, the ESD200 USB 3.0 Portable Solid State Drive is perfect for those demanding high-speed data transfer. The ESD200’s lightweight, compact design and solid state durability make it ideal for storing, protecting, carrying and sharing all your digital files wherever you go. 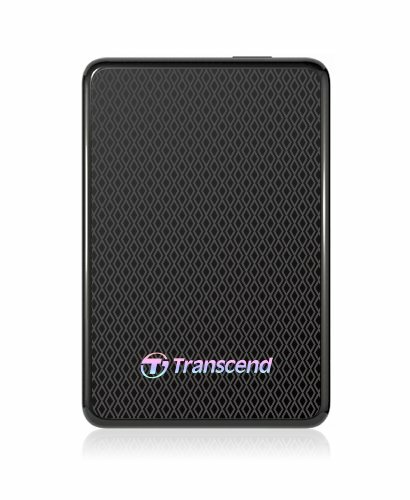 The ESD200 portable hard drive is equipped with the next-generation SuperSpeed USB 3.0 interface that provides 10 times the bandwidth of USB 2.0. Thanks to its use of USB 3.0, the ESD200 makes file sharing easier and quicker than ever with real-world transfer speeds of up to 260MB/s. Taking full advantage of solid-state storage technology, the ESD200 runs cool and silent, and can withstand excessive shock and vibration. About the size of a credit card, the ESD200 is ultra light and easy to carry, and includes a handy travel pouch to protect the drive’s sleek outer case against scratches during transport. Available in 128GB and 256GB capacities, the ESD200 can carry your entire collection of movies, music, documents, eBooks, and photos – all in the palm of your hand. Each 256GB drive can store a full 112 hours of DVD footage, over 4,000 hours of digital music, or 120,000+ high resolution digital images. Using the ESD200 on your computer couldn’t be easier. Simply connect the drive to a SuperSpeed USB 3.0 port and drag and drop desired files to and from the device. The ESD200 supports Microsoft Windows 8/7/Vista/XP, Mac OS X, and Linux systems, and is backwards compatible with USB 2.0 ports. For added value, the ESD200 includes a free download of the exclusive Transcend Elite data management tools that help you manage data and increase productivity. With this convenient software, you can easily perform incremental backups, compress files with 256-bit AES Encryption, and much more. 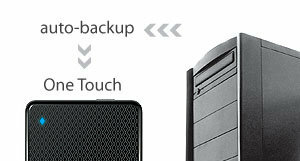 The ESD200 is equipped with an extremely convenient One Touch auto-backup button for instant data backup and synchronization when used with Transcend Elite software. 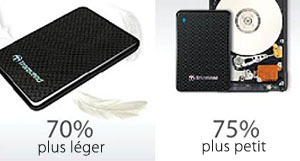 ESD200 Portable Solid State Drive, Quick Start Guide, USB 3.0 Cable, Warranty Card. 1 Based on 2MB file size. 2 Based on 4min per song, 128Kbps quality. 3 Based on 2.25GB per hour DVD quality. Storage capacity approximations are for general reference only. Actual results will vary depending on resolution, compression quality, video frame rate/interlace settings, and content. 1GB = 1 billion bytes. A certain portion of the storage capacity may be reserved for firmware and maintenance use. *Note: speed may vary depending on the device and usage of hardware or software.